"London is our heartland and we wanted to stick our flag firmly in the ground on home turf. We are so excited to reveal another round of additions to the line-up for our first ever London festival, which will be at Central Park, Rainham Road on Saturday 14th September. Claptone, India (Live), Teni Tinks (Live), Fiorious (Live), Amine Edge & DANCE, CJ Mackintosh, Copyright, Ferreck Dawn, Heller & Farley, Hifi Sean, Mike Dunn, Robosonic, Smokin Jo and X-Press 2 have been added, joining over thirty acts already announced, including Honey Dijon, Horse Meat Disco, Dennis Ferrer, Dimitri From Paris and Sam Divine. 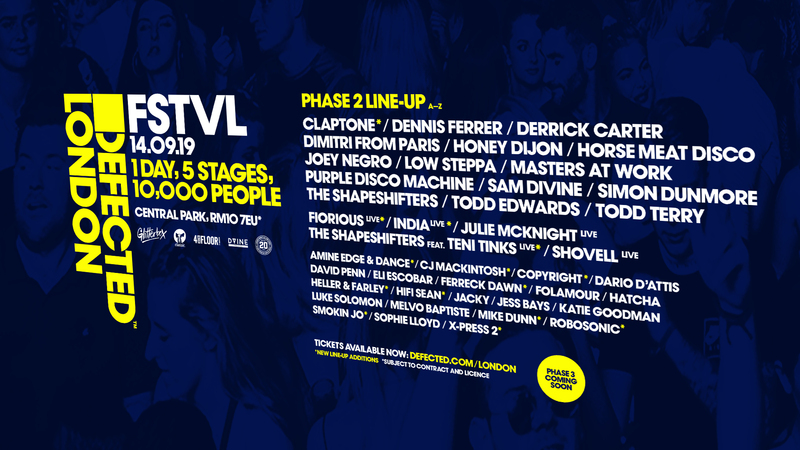 The ultimate summer closing party, Defected London FSTVL will feature five stages curated by Glitterbox, Classic Music Company, 4 To The Floor, DVINE Sounds and of course Defected. While our events continue to tour year-around all over the world, Defected London FSTVL will celebrate our hometown, showcasing pioneers of the London dance music scene; Ivor Novello winners X-Press 2, ex-Ministry Of Sound resident and mix maestro CJ Mackintosh and prolific producers and label heads Heller & Farley represent London’s dance music history of the last 35 years. The world-class talents of our residents, legends and breakthrough acts will be spread over the five stages, showcasing all the branches of the label family in one place. Defected London FSTVL will be Defected’s biggest ever event in the capital, building on recent sell out shows at Ministry of Sound, Studio 338 and Printworks, some of which sold out in minutes. With that kind of demand evident in our home town, we feel that the 10,000+ capacity festival is the natural next step, especially considering we're marking a special landmark like 20 years.